Get a full introduction to the course and self-publishing. Learn all about your instructor, and his background. Understand exactly what self-publishing is and the best way to do it in 2017. In depth topics like: when you can expect success, and the best 4-step process for publishing a book will be discussed in this module as well. Success is all mental. Your life, your business, and your world, are all a result of how you think. Learn how to think about self-publishing and how to think about business in this module. Module 1 discusses mindset, realistic goal setting, and how to accurately predict the number of books and the amount of money you will need to reach a particular income goal with self-publishing. Selecting a niche is very important. In this module you will learn everything about the role of niches in your publishing operation. Finish this module to learn: A unique publishing strategy that will future-proof your business; The 3 best methods for finding niches without brainstorming; And learn how to find 100's of topics to publish books on. Quality control is HUGE in self-publishing. And making proper outlines for your books will make a big difference in the readability of your works and the amount of value you will provide your readers. Outlines should contain information from multiple sources. Many of these resources are overlooked and in this module we learn how to make a proper outline that will make the task of writing a book much simpler. A good team will make achieving your goals much simpler. This module is all about hiring your first team members. You will learn the exact amounts of money you should be paying for every task when outsourcing. You will learn exactly which tasks should be outsourced when you are getting started. You will even learn the best countries to hire from to get the best skills without overpaying. The goal of module 4 is to help you build a solid team of trustworthy workers at a profitable price. In this module you will learn how to properly assign work and create effective workflows for getting your books written and your covers designed. Module 5 is about managing your team and creating a good relationship. Module 5 also deals extensively with book cover design, and how to work with your cover designer to get book covers created that look professional and stand out over other self-published books. In this module you will learn the 3 phases that every book must go though to have the highest quality and the best chance for generating long term predictable income. The goal of this module is to get your book formatted, uploaded, and published with the highest quality to generate a predictable monthly income from consistent sales. 9 hrs 5 mins of detailed instructions, conversations, and screen sharing to guide you through the self-publishing process. Members get lifetime access to the course and all updates. As a lifetime member you get access to a email address for members only to send your answers to the course instructor to get responses. Niche List: This worksheet contains over 100 unique niches. These niches will be used in the course to help you build a brand. Goal Setting Worksheet: An outline and explanation of the exact math you should be performing to estimate all aspects of your future income and acheiving it. Job descriptions: Exact scripts for job descriptions that should be copy and pasted online to get the highest quality applicants at the most profitable prices. A straight forward, detailed guide to build a real online business that generates predictable monthly income. How a normal college educated corporate worker replaced his full-time income by self-publishing books. The importance of the holiday season (Q4) in a self-publishing business and how much you can expect your income to surge in these months. A method for earning anywhere from $500.00 to $3,000.00(+) per month in fairly passive income from royalties earned through book sales. Why a self-publishing business is the same as investing in real estate and how a self-publishing business is actually a better investment. The best mindset for starting a business and how to properly think about self-publishing. The exact amounts of money that are needed to start a self-publishing business and which amounts of money will provide the best chances at success. A method for getting started with no money. And sincere honest advice for anyone starting this way. Which platforms are the best for building a successful self-publishing business in 2017. How to properly price your books, to get the best feedback from readers and the most sales. An experience based method for getting book covers that grab attention, look professional, and make your books stand out from the competition. 4 simple things needed to get started successfully with self-publishing. A general timeline of when you can expect to be earning consistent predictable income from self-publishing, the things that will increase your chances at success and the things that will diminish your chances at success. How to properly set goals for yourself when getting started in self-publishing. How to accurately and realistically estimate the amount of time, books, and money you will need to achieve any level of income with self-publishing. The best way to maximize any investment in self-publishing to generate the most income. An age-old method for saving money to invest in this business and 4 additional methods for quickly making money to get with this business. An honest evaluation of debt and how it should be used in your self-publishing business. A 4-Step publishing process. That is easily repeatable. The 1 characteristic of all high earning self-publishers and a strategy for achieving similarly high levels of success over time. Exactly what your biggest struggle will be when just getting started with self-publishing and ways to deal with it. A simple hack for interacting with outsourced workers on Upwork.com that will leave you with a perfect client profile and make freelancers want to work for you. What mindset you should have when self-publishing that will make progress and scaling easy and provide you best opportunity to succeed in the long-term. The two different self-publishing strategies that you can employ when getting started, which is the best, and why. The best publishing method that is future proof and will grow over time even as the self-publishing marketplace becomes more crowded. 2 simple methods for finding book topics that will require little no brainstorming. How other self-publishers are competing against you and their exact publishing strategy will be explained. An effective method for building a powerful and recognizable brand. How to make effective book outlines that will make the job of writing and outsourcing books much easier. 5 different sources of information that should be used when creating an outline. The best way to think about your writers so they create books that are extremely high quality. A powerful method to write your own books from beginning to end within almost any deadline. How to create an easy list that all your books should end with that will provide more value to the reader, and increase the chances of them liking the more book more. A simple resource that should be added to all your books that will increase the number of pages in the book, keep readers engaged, and take almost no effort to create. How to effectively outsource work in your self-publishing business. The 3 best countries for outsource writing. These countries will provide amazing quality with very low costs. The 2 best countries for outsourcing your book covers. Illustrators from these countries will be very talented, make beautiful designs, and have low cost. Where to purchase high resolution stock photography for your books and book covers will be very low cost and have a huge selection. A clear method and set of instructions for building your first team of workers to you reach your income goals. The exact amounts of money you should pay outsourced workers for completing different types of tasks. An experience based and theory based method for getting value from bad outsourced work. How long a self-published book should be, how to deal with book length over the long-term, and the exact number of pages a book should be to get the best feedback from readers. How to format books and apply styles for the best digital viewing experiencing. How to format books and apply styles for print publication. The theory of typefaces and fonts, their role in viewing media, and which fonts are the best for digital and print viewing. An easy method for turning a basic 20 page outsourced eBook book to 84 pages digitally and 68 pages in print while following all of the Kindle Publishing Formatting Guidelines. All the principles of proper book cover design and how to make the cover design process easier you’re your illustrator. The exact workflow that should be used with your book cover designer to produce the most content, in the shortest amount of time, with the highest quality. How to write an effective Book Blurb / Product Description and a method for easily outsourcing most of this task effectively. How to select an effective title and subtitle for your books that will give your books more visibility and more sales over the long-term. Learn an alternative form of investment that many people are overlooking. 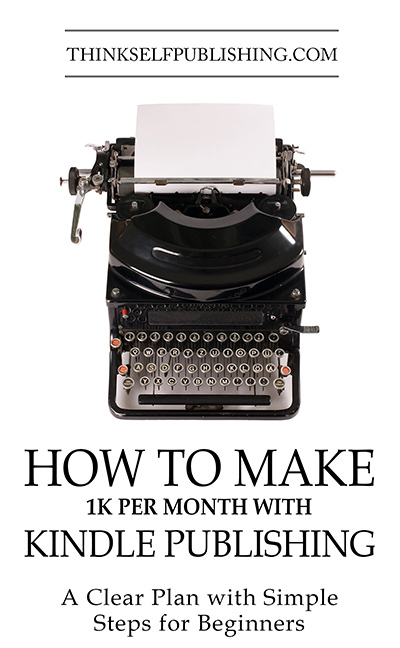 Go from complete beginner to successful publisher with step-by-step, realistic, instructions.